The season is coming...The garden will soon overwhelm us with its bounty. If not the garden, then the farmer's market or the bargain veggies at the grocer's. The economy may be on its way back up, but we've all learned a lesson about saving where you can because you never know what's around the next corner. Dehydration preserves certain qualities of food lost in other methods. You'll get more of the nutritional value from food processed this way than with canned. The cabinet is made to block light, keeping even more vitamins in the food. I don't like every type of dehydrated food, but even if I only saved my favorites or enough to prepare some snacks, stock, soup, dried meals, the unit would serve me well. This machine has a twenty-six-hour timer, so you can set up the trays and leave it to do all the work. Excalibur provides an amazing store of information, including free instructional videos to help you get started. They demonstrate methods of use with which even I wasn't familiar. I plan to make my own trail food, which is ex-pen-sive-o when bought pre-packaged. I have special dietary requirements that make finding a mix I can use difficult. This method saves me a lot of time and money. I get exactly what I want (and like). That applies to any food you make on your own; you control the contents. You are not likely to add extra preservatives and sugar unless you want them, unlike a manufacturer. 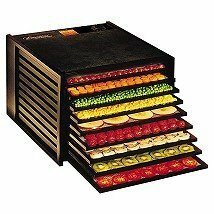 Also see the Nesco American Harvest dehydrator.